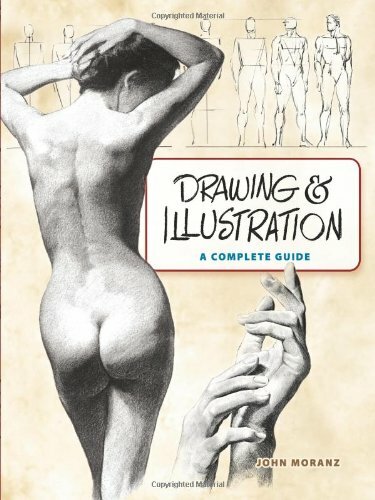 This book on drawing instantly reminds me of Figure Drawing for All It's Worth by Andrew Loomis. The wonderfully illustrated examples look so similar, in terms of style and the subjects drawn. The book covers a bit of everything. There's drawing the figure, drapery, perspective, composition, advertising and even animals. Don't buy this book thinking it's a dedicated figure drawing book, because it's not, although half of it is actually on figure drawing. The teaching style here is basically showing you some really good illustrated examples and useful tips on each subject. The figure drawing examples are real good but the rest are somewhat dated, especially examples for advertising. There's a major downside considering this is a book that teaches drawing. Compared to other books, it lacks the use of guides as a construction tools, guides like box, blocks, mannequins. While drawing from examples shouldn't be too hard, constructing your own figure will be very challenging. While the tips are insightful, they aren't the step-by-step instructions anyone can follow along to. So if you're looking to construct your own figure, you might have to look elsewhere. The figure drawing illustrations are great though.